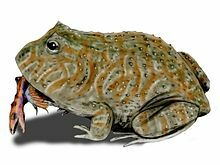 Beelzebufo ampinga (/biːˌɛlzɪˈbjuːfoʊ æmˈpɪŋɡə/ or /ˌbiːlzəˈbjuːfoʊ/) was a particularly large species of prehistoric frog described in 2008. Common names assigned by the popular media include Killer Bean, devil toad, and the frog from hell. Fossils of Beelzebufo have been recovered from strata of the Maevarano Formation in Madagascar, dating to the late Cretaceous period, some 70 million years ago (Mya). The generic name Beelzebufo is a portmanteau of Beelzebub (a Semitic deity whose name may be translated as "Lord of the Flies", sometimes identified either as one of the chief lieutenants, or alter ego of the Christian Devil) and bufo (Latin for "toad"). The specific name ampinga means "shield" in Malagasy. Animals of this species may have grown to at least 23.2 cm (9.1 in) (snout-vent length), which is still around the size a modern African Bullfrog can reach. The head of Beelzebufo was very big, and bones of the skull roof show a rugous external surface, indicating at least parts of the head may have borne bony scales, called scutes. The skull sutures are open in even the biggest species of Beelzebufo, showing that it may have grown even bigger. Some estimates suggest snout-vent lengths of up to or beyond 40 cm (15.7 in). Although the fossils of Beelzebufo appear in what is now Madagascar, which, still attached to India, had split from the coast of Somalia in the earliest stage of the late Jurassic, it superficially resembles its closest living relatives, the horned toads of South America, of which the largest today grow to 15 cm (5.9 in) long. As West Gondwana (South America) rifted away from East Gondwana, opening from the north and spreading southward, open marine conditions in the widening South Atlantic obtained by about 110 Mya, isolating the amphibians on either side; the last common ancestor of Beelzebufo and the South American Ceratophryidae is most likely to have existed before that date and probably before seafloor-spreading demonstrates the earlier isolation of Madagascar-India, a very long time undocumented by fossils. Alternatively, the history of archaeogeography could be rewritten: Richard Lane, program director in NSF's Division of Earth Sciences, said, "The occurrence of this frog in Madagascar and its relatives' existence in South America provides strong evidence that the supercontinent Gondwana 'disassembled' during the latest part of the Cretaceous." Size and shape comparison of Beelzebufo with a typical six-inch-long (15-cm) American bullfrog (Rana catesbeiana). Cranwell's horned frog (Ceratophrys cranwelli) is standing in as a model for the former. The first fossil fragments were found in 1993 by David W. Krause of New York's Stony Brook University, but it took 14 years for scientists Susan E. Evans, Marc E. H. Jones, and Krause to assemble enough data for publication in the Proceedings of the National Academy of Sciences, the journal of the United States National Academy of Sciences. Some 75 fossil fragments have been found. Researchers have been able to reconstruct parts of the frog's skeleton, including nearly the entire skull. Wikimedia Commons has media related to Beelzebufo. ^ a b Dybas, Cheryl (2008-02-18). "Scientists Discover 'Giant Fossil Frog from Hell'". Press Release 08-025. National Science Foundation. Archived from the original on 26 February 2008. Retrieved 2008-02-19. ^ "Scientists find 'Devil Toad' fossil". Associated Press. 2008-02-18. Retrieved 2008-02-19. ^ Hooper, Rowan (2008-02-18). "Giant prehistoric frog hints at ancient land link". New Scientist. Archived from the original on 26 February 2008. Retrieved 2008-02-19. ^ a b Evans, Susan E.; Jones, Marc E. H.; David W. Krause (2008). "A giant frog with South American affinities from the Late Cretaceous of Madagascar". Proceedings of the National Academy of Sciences of the United States of America. 105 (8): 2951–2956. doi:10.1073/pnas.0707599105. PMC 2268566. PMID 18287076. ^ Lawrence A. Lawver, Lisa M. Gahagan and Ian w.D. Dalziel, "A tight-fit early Mesozoic Gondwana: a plate reconstruction perspective", 1999, p. 5 "Africa-Madagascar", with citations (on-line text Archived 2008-10-12 at the Wayback Machine). ^ Frogs of Gondwana are only very spottily represented in fossils. ^ "'Frog from hell' fossil unearthed". BBC News. 2008-02-18. Archived from the original on 21 February 2008. Retrieved 2008-02-18. This page was last edited on 21 January 2019, at 17:34 (UTC).